When you enrol on any of our online HE Programmes (including our new BA (Hons) Music Production & Sound Engineering Degree), or online Diploma Programmes you’ll receive a free copy of the latest version of Ableton Live Suite worth £520/$750 (with Ableton software selected). When you enrol on any of our online HE Programmes (including our new BA (Hons) Music Production & Sound Engineering Degree), or online Diploma Programmes you will get a free copy of the latest version of Logic Pro (with Logic software selected). All online students can buy Komplete 12 and Komplete 12 Ultimate for a massive discount of 50%. That’s a whopping saving and gives you everything you need to start making great music. Please note that discounts are not available on upgrades. Designed and built in the UK, Aston Microphones bypass create innovative and beautiful products which outperform far costlier ‘industry standard’ offerings from the big brands. Contact gavin@kazbarsystemsinc.com with a copy of your student ID to take advantage. We’re pleased to say that, as part of a partnership with online music retailers, DV247, Point Blank Online students can get up to 50% off selected products. For more details, contact jim@DV247.com with the particular product(s) you’re interested in. Our good friends at Novation and Focusrite have offered up a great discount for our online students. 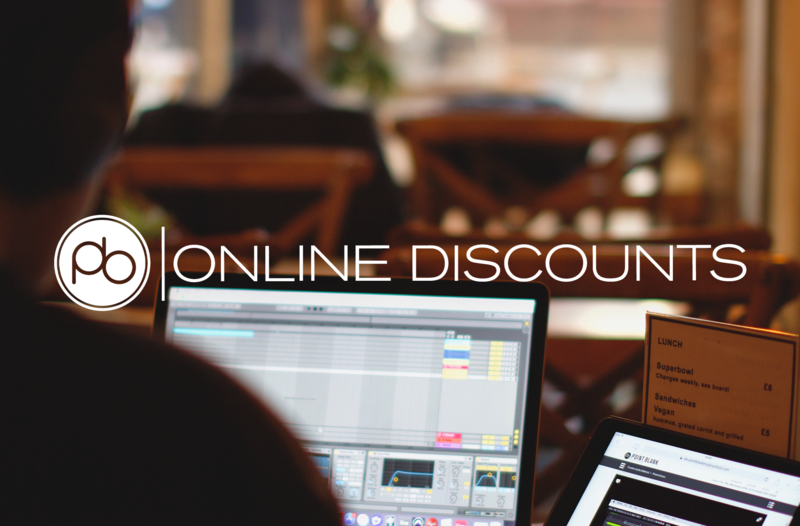 Once you’re signed up for a course, just head here to fill in your details – you can get 10% off all current prices on selected Novation and Focusrite products. UVI is an excellent developer of software instruments, effects and soundware, with their software used around the world at live shows, on hit-records, in blockbuster films and AAA games. We are proud to offer our Online students 30% off their entire range of software products. Click here for information on how to claim your discount. Get 320mb+ of free content. This carefully curated sound pack incorporates cutting edge elements from the most up to the minute sounds in underground music, which you will be able to use throughout your studies. 500 free Loopcloud shop points are included with registration. Loopmasters are also offering an incredible discount of 20% on the first purchase of any Loopmasters product for Point Blank students. Output are the creator of some ground breaking plugins and instrument libraries, including REV, Signal and EXHALE, opening up a world of sound design which has been consistently hailed as “inspiring” and “creative” for producers, composers and musicians. Head here for details of accessing a 30% discount. From festival tickets to money off electronic products, there are an array of discounts available with a valid NUS Extra card. Check out their available discounts to see what NUS has to offer, including discounts on festival tickets. Please note that NUS cards are open available only to students studying a higher education programme.Contact the Support team for further information on how to apply.